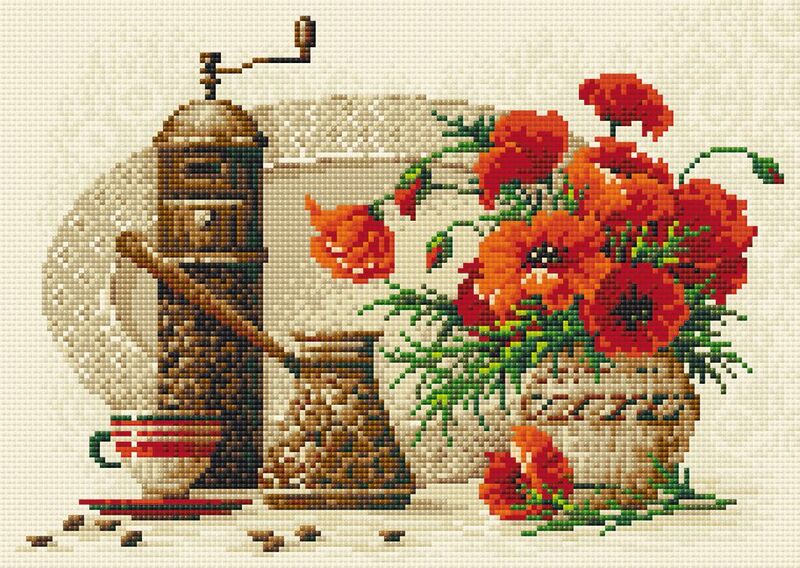 This Diamond Mosaic design from RIOLIS features a vintage scene showing coffee being prepared alongside a red vase of poppies. Diamond Mosaic is a new craft - also known as Diamond Painting or Diamond Stitching - gives an amazing result. RIOLIS have carefully created each design using their own talented professional artists. Both adults and children will enjoy these kits, made of square diamonds that are similar to embroidery stitches - now you can create bright and shining designs with just a few steps! RIOLIS have released the very best of their designs from their own existing collection. Square diamonds have been chosen as the best shape. The shape also covers up the entire canvas meaning that the finished design looks more tidy and complete. The instructions are very easy: Just remove a small part of the protective film on the pre-printed adhesive canvas and place the crystals on the canvas using the attached tweezers. You simply follow the provided colour and symbol key to know where each of the diamonds go. 1. Complete instructions in English, French, Spanish, German, Italian and Russian.